Behrendt: “We've not seen the level of supplier distress we expected." DETROIT -- The threat of widespread distress in either the North American or European automotive parts-supply base has eased, but worries remain, Ford Motor Co. purchasing executives said. Ford of Europe purchasing head Birgit Behrendt said: “We've not seen the level of supplier distress we expected” in Europe. She noted that suppliers have been aided by scrappage schemes that boosted industrywide volume. “As scrappage runs out, the truth will come to bear” in the second quarter, she said. And in North America, excess capacity continues to plague the industry, Tony Brown, Ford's global purchasing chief, said. Suppliers surveyed recently by UBS Securities generally agreed with the views of Brown and Behrendt. Brown said Ford continues to monitor suppliers' financial health. “Even though the short-term financials” have looked good, “look at debt maturation,” he said. “Banks are still being very conservative,” and “we'll have to see” whether other sources of credit are available to suppliers when they need to refinance their debt, Brown said. He said there was no single period, such as the third quarter, when supplier debt is coming due. Those debts stretch out over the next two years, Brown said. Peter Lake, executive vice president of sales and business development at TRW Automotive Holdings Corp., said in an interview that difficultly in getting credit has left small and medium suppliers at risk, forcing larger suppliers to make tough choices. "You have to actively manage those situations, or you have to make sure you are dual sourcing or you are anticipating the issues and changing sources," Lake said. Separately, a U.S. auto supplier report by UBS Securities that Brown cited found that the risk of suppliers' going bankrupt is the lowest since the first quarter of 2009. Just 6 percent of the 68 respondents to a UBS survey reported a greater than 50 percent probability of their company going bankrupt, down from 7 percent during the fourth quarter of last year and 10 percent during the third quarter of last year. The survey, a copy of which was obtained by Automotive News, was taken last month. 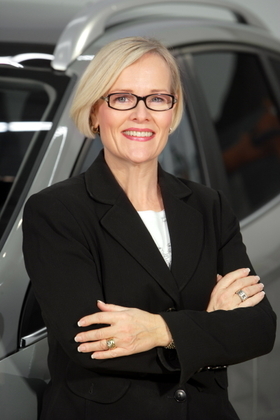 “The resiliency of the automotive suppliers is amazing. It's a huge compliment” to them, Brown said. Suppliers reporting the highest risk of bankruptcy to UBS were those dependent on General Motors Co. and those supplying frames, structures and exterior components. The respondents to the UBS survey agreed with Brown's assessment that overcapacity remains a problem. A slight majority of respondents to the UBS survey, 51 percent, said that overcapacity was at least somewhat addressed by the industry downturn. But 49 percent said that it did not reduce capacity enough or at all. On average, diversified suppliers, as well as suppliers operating in the seating/interiors and electrical/electronic/safety segments believe there is still excess capacity hanging over the industry. Ford's global purchasing budget is about $65 billion a year. About $50 billion goes for production parts and $15 billion for nonproduction purchases, such as transportation costs.